It was too big, but luckily it does come in a smaller size, so I have sent it back for an exchange. I suspect I will still have to shorten the sleeves, but hopefully the body will fit. In a size 10 (the “right” size according to my measurements) it was like an overcoat and hung off my shoulders. It is made of the most beautiful Yorkshire wool from Abraham Moon’s mill. Gorgeous. I hope size 8 fits! And meantime, your super-helpful comments filled my in-box. I knew that you would not let me down! Several people approved the shift-dress plan. 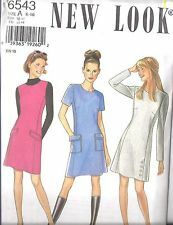 I am definitely going to try out New Look 6543. Some doubt was expressed about the patch pockets. How funny – that was one of things that drew me to the pattern! I will need to wait and see how long the jacket is. If it is as short as I think it might be, the pockets would fall below it, and add a bit of… interest? Because as I read your comments, I had a rising feeling of panic. No flippy, frilly or gathered? No details? No colour? 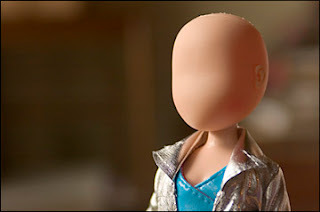 An aside: I took that picture from a blog article on faceless dolls, written by an American Muslim mother who wants to strike the right cultural balance for her daughter. The doll above is basically an anonymised Barbie. It is a very interesting article. I realised that I was in danger of going too far down the path of corporate conformity. Particularly since I don’t even work in the private sector. Yes, I think I have strayed too far into Dressdown Friday territory on an everyday basis, but my working environment (Education) is one which ought to embrace creativity. If it doesn’t, there is something terribly wrong (a debate for another day). All these thoughts were whirling round my head as I wandered round Superdrug looking for hair conditioner (jacket, shoes, hair…) and I found myself picking up a packet of Cosmic Violet hair dye. My heart was pounding with excitement. I could go purple again! It would be so AMAZING! I could be… ME? And there’s the thing: I have not lived on this earth for 48 years in order to give up my identity the moment I hit middle age. Just because I am expected to blend in with the walls, does not mean I should. So I won’t. That way madness lies. And I don’t think I knew how important it was to me until now. So please don’t anyone feel bad about the guidance you offered. I needed to be confronted with the reality of what I was trying to do, and the rules and mind-set I was trying to adopt. I would have been a fraud and I simply can’t live like that. I can’t walk around without an identity, a faceless minion. I didn’t survive this long in the workplace by pretending to be someone I am not. P.S. I didn’t buy the dye… yet.